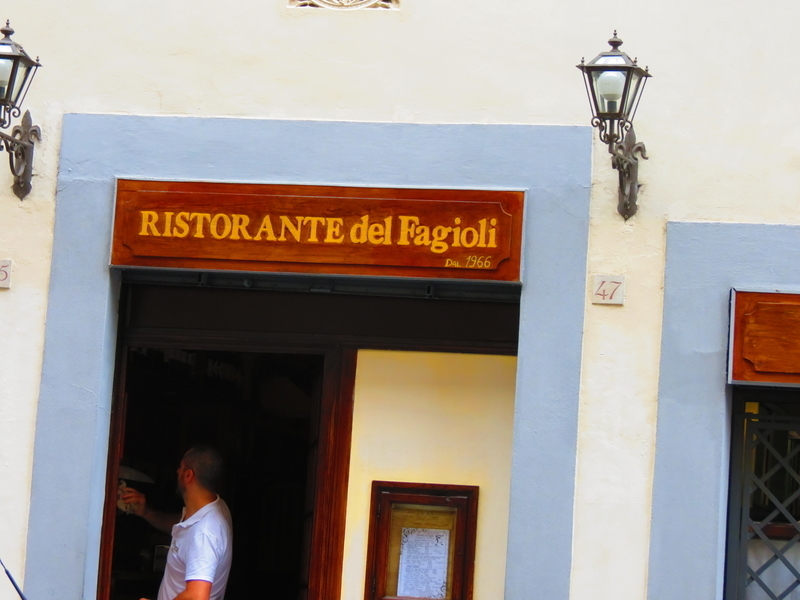 We recently dined at Ristorante del Fagioli based on the recommendation of several Florentine blogger friends who praised their rustic Tuscan cuisine and great prices. There was a heavy down-pour on our first night in Florence, so after considering our options, we found it best to try this place which was only a couple of blocks away from our hotel overlooking the Arno. Modestly tucked between small local shops away from the main stretch of high-end boutiques and restaurants, del Fagioli is the type of place you go to when you’re in need of a warm atmosphere and comforting home-style food. It’s one of those places that feels out of a movie; Chianti bottles hanging from the walls in their signature straw baskets, a dining room mixed with actual Italians harmoniously dining among curious travelers. A no-fuss handwritten menu featuring some of the region’s most popular dishes (yes, including bistecca alla Florentina) at a fraction of the cost of most other neighboring joints. There was a charm about the place. It was like we’d been there before. Weary from a long day out and about in the rain, we mistakenly (perhaps fortunately) let our stomachs order instead of our brains. And while we both agreed that we ordered entirely too much food, everything was delicious and was expediently brought to our table without much lag in their uber-friendly service. We started off with a crostini appetizer topped with none other than silky melt-in-your-mouth fatty lardo and rosemary; local bread grilled just enough to give the lardo a bit of warmth. We followed it up with two pasta dishes: rigatoni in a rich veal ragu for him and the most amazing and simple tortelli, freshly made and stuffed with ricotta and lemon in a bright tomato sauce. Every bite of my dish was perfect; the cheese’s richness cut with a nice balance of acidity. At this point in the meal and halfway through our bottle of wine, I was just about ready to roll over and go to bed. But then the entrees came. Involtini for him and a plate of Bollito Misto (mixed boiled meats) with a side of fagioli (white Tuscan beans, their namesake). As we tried to eat as much of these dishes as we could, we had over-estimated our hunger. His dish was dense, rich,and comforting; mine being a complete protein on protein fest. The meat was tender and savory; the beans, petite and plump– delicately flavored with local olive oil and a simple dusting of salt and pepper. This is the meal you want after a long day. When it’s a little chilly and you want to feel warm from the inside out. If in Florence and looking for a good hearty meal at low prices, del Fagioli’s got what you need. Reservations are highly recommended. Ristorante del Fagioli, Corso Tintori 47R, Florence, Italy.